To kill or not to kill. Daredevil as killer. Because that first step over the line… That decision to take the life of a murderer — and become one myself… That was all me. And everything that followed on from it — the insanity, darkness and death — that’s the burden I have to carry… Down a long and lonely road paved with good intentions. Interestingly, the admission on Matt’s part that he, and not the Beast, was responsible for Bullseye’s death, has caused at least something of a stir online since it firmly places Daredevil into the category of heroes who have actually intentionally killed someone. Now, I thought it was pretty clear earlier on that it was this act which caused the Beast to take hold of Matt’s psyche so I’m surprised that the reactions I’ve seen are coming now. Either way, I thought I’d take this opportunity to open the comment field up for debate on the topic of killing generally, since I suspect people have very different views on it. Well, whether Daredevil taking another person’s life, no matter how severe the circumstances, can ever be in character that is. Before leaving you to voice your opinions, I suppose I should add my own. 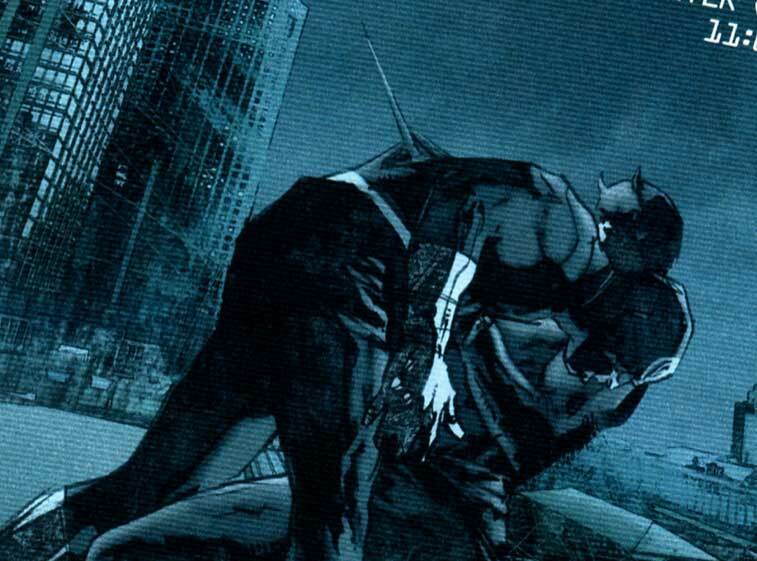 I personally didn’t mind that Daredevil killed Bullseye. It doesn’t, in and of itself, diminish his inherent nobility at all in my mind and it was certainly, to me, one of the least problematic aspects of the entire Shadowland storyline. My reaction was more one of “good riddance” than anything else. The way I see it, killing Bullseye is akin to going back in time to kill Hitler. If I could go back and prevent the German dictator from invading half of Europe and set up death camps, killing tens of millions of people in the process, I absolutely would. I think most people would. That doesn’t mean killing can ever be legal (I also oppose the death penalty, its finality requires a degree of certainty that no legal system can provide), but, on rare occasions, killing is not necessarily immoral. By killing Bullseye, we know for a fact that Daredevil has probably saved the lives of countless unknown people who would otherwise have fallen victim to a man who has already killed hundreds. At this point, I can hear one or two of you thinking “Well, if Daredevil is allowed to kill, even scum like Bullseye, then how would he be different from the Punisher?” That’s a valid point, and I don’t think any genuine Daredevil fan would like to see him become more violent. Just because killing a mass-murderer might appear warranted in certain extreme circumstance, it doesn’t mean that crossing the line into killing isn’t a huge deal. It is, and my guess is that we can expect Matt to spend a good amount of time chastising himself for this decision during Daredevil: Reborn. As a lawyer, and as someone who seems to worship at the altar of order and structure, there are also other reasons why Matt would be averse to killing, beyond the moral implications: It represents a descent into anarchy, and violates his rigid code of conduct. Killing is absolutely out of character for Daredevil, but killing Bullseye should, in my mind, be seen more as a justified(?) aberration, and not as an act that, by itself, taints the character and makes him someone he is not. And, if he lives out the rest of his fictional days having killed only once, no one deserved it more than his arch-enemy. I know this is a big deal to a lot of fans, and everybody’s opinions have a place here, so please weigh in with a comment! Daredevil gifts for the holidays! From the issues leading up to Shadowland I was under the impression that the Beast was already influencing Matt a great deal, but Matt was still in control. Then suddenly in Shadowland #1 he was a full on villain with no buildup, so I thought the Beast was in control and killed Bullseye, but apparently not. Just another example of bad storytelling in this whole thing. More to your point though, I agree that this shouldn’t be such a big deal and Bullseye’s death is mostly justifiable. This reminds me of all the Bat-fans that scream that Batman or Gordon would be no better than the Joker if they put him down. Putting down a mad dog is not a crime. It is not murder and it is not wrong. It is just, and it is protecting future deaths that will occur at the hands of these madmen. I’m pretty liberal and proud of it, but killing in self-defense or killing a murderer to prevent them from murdering again is not wrong in any way. Born Again – shoots a helicopter pilot out of the sky. blows up the dock that was full of thugs. Death of Elektra – Matt dropped Bullseye with the intention of him dying from the fall. Now anyone can argue that TMWF isn’t the official origin (it absolutely should be though) but those other two stories are pretty “official”. This pretty much applies to most situations in superhero comics that involves heroes killing or thinking about killing the villains at this point. The villain’s action are often so outrageous that not killing them makes the heroes look, at best, like idiots that can’t understand that by not taking more drastic actions, which don’t necessarily have to include killing, that they are in some ways complacent in the acts the villains take. Of course, the larger problem is that the heroes should not be put in a situation where killing the villains where rational option in the first place. Daredevil shouldn’t “have” to kill Bullseye and Batman shouldn’t “have” to kill the Joker and it really points to a fundamental inability on the part of the writers and editors to come up with different ways to make the villains threatening or that they can’t do any stories that are not in some way sensationalistic. I think that the impact of killing should be felt by Matt Murdock much more strongly than it would be felt by, for example, Spider-Man. We all know Spider-Man is a good guy through and through, but his life is not nearly so segmented into right and wrong as that of Matt. Spider-Man is moral on a less analytic plane than Daredevil. See, that’s why I don’t like this new change. It just feels far too drastic. Daredevil is so heavily predicated upon the fact that he’s a hero who doesn’t kill. He believes in the justice system and that’s how he deals with villains on a final scale. That’s who he is. He has fought Bullseye countless times before, and Bullseye has killed two of his loves, and yet Daredevil still hasn’t tried to kill him. To suddenly change course and kill Bullseye, which the Snakeroot said was the act that allowed the Beast to take hold of him, was exceptionally poorly written. There was no build up or logic to the act. I could understand DD killing Bullseye if he did something bad, like killed yet another love. Maybe the first two deaths didn’t push him over the egde, this one did. I could dig that, but instead nothing really happened. Bullseye had been off DD’s radar for quite some time during his stints on the Thunderbolts and Dark Avengers and so DD killing him didn’t feel like an organic progression. It felt completely forced, which was a shame. It was opportunity to take DD in a new direction but it was lazily done. I don’t think Daredevil should ever kill, but if he did there’s no doubt it would be Bullseye who would cop it. If only Bullseye had deserved it. Him turning up and calling Murdock out wasn’t grounds for dismissal. It was a twist thrown in for its own sake and it just doesn’t gel for me. I’m interested to see how Murdock makes himself feel better about it all but with the way Diggle has treated the chcracter so far I don’t have faith he’ll do the whole premise justice. If it’s a forgiveness as lazily set up as the fall from grace then I have no interest in it. Sadly. I say, bring on Rick Remender for the writing job in about a year. This reminds me of the old philosophy problem of the man on the train tracks. Basically the story goes that there is a man on the train tracks, train is headed towards him and it doesn’t have time to stop. You as the switchman see all of this happening. Now you know that there could be 10 workers on the other track that are doing repairs however you don’t know if they are there today. So the question is do you keep the train on its current course and kill the man or do you hope that the workers on the other track aren’t there today and send the train that way. It’s essentially the same problem: Do you kill Bullseye or do you just put him in jail and hope he doesn’t kill 10 people if/when he escapes? I personally think it’s out of character for Matt to actually kill Bullseye even if he’s tempted by it. In the end Matt is a believer in justice and the justice system. He knows that as a private citizen he can’t take the death penalty into his own hands because that would make him almost as bad as the people who he’s trying to destroy. After all when the law comes into his hands where does he stop? Who is he to decide who lives and dies? Just because someone’s killed before doesn’t mean they can’t or won’t change. And as Osborn was so fond of pointing out during Dark Reign, many of the Avengers broke the law prior to becoming Avengers. Anyway that’s my rant on the subject, I’m curious to hear other people’s thoughts as well. In going along with the strict code of law, since Daredevil killed Bullseye and everybody knows he did shouldn’t there be a trial?Think of it. Matt defending himself? If he loses and get’s life we could have Joe Quesada in charge of a new title “Daredevil: Life on the inside!”Just an attempt to lighten the mood?! Would we really be suprised if they went that way with all that has been happening with Marvel over the last couple of years and titles? It’s repulsive and lazy writing to have DD just kill anyone in cold blood. I’ve been so disgusted by the writers taking Matt in this direction, I’m not even sure I should weigh in. There’s a big difference between killing in self-defense, or as a desperate act to save the lives of others, and just serving ones own rage. People dieing as a result of their violent lives isn’t new to the genre or DD’s world, but using this particular part of Matt, which I find core to the character, to try to make a indelible moment in DD history (Miller style), is like a kick in the gut. Shadowland hasn’t been very good, it’s come off as an event that’s existed just to sell books, and it didn’t come about very organically. It’s forced Matt out of his own book with no dignity. If the goal was to disappoint fans, mission accomplished. There are several stories that show Matt has insight into where killing, his killing, would lead. For some reason, that entire canon went out the window in a hand full of issues. I found myself hoping that the story wouldn’t turn out to be so obvious, that there was more to Matt killing Bulls (I can barely write it) than what was on the surface. I thought, well, maybe Bullseye was also an adept, and needed to be cleansed like Elektra. An act of mercy veiled in anger would have been surprising and more in keeping with Matt’s character. Or maybe he avoided Bullseye vital organs to fake his death, to lure the Snakeroot out of the woodwork … or something. Nah, lets just make him a killer with no dignity that works too. I’ve made no secret of how much I think Shadowland has sucked, but Matt finally killing bullseye is one of the only good things in the story. I don’t think it came out of left field at all. As I said above I thought he was already under the control of the beast but that was just the bad writing not making things very clear. Whether he was or wasn’t I have no problem with him taking him out. What? Should he have asked Bullseye to please stop killing his ninjas and think about what he’s doing and the lives he’s destroyed in the past and talked it out over ice cream sundaes? The ONLY thing Matt Murdock should be beating himself up about is the fact that he didn’t do it years ago like any responsible person. Bullseye’s not going to see the error of his ways. He’s not going to get rehabilitated. He gets off on killing. How many people would be “alive” in the Marvel if he’d been put down years ago. Eric really nails it above. Another problem is the writers. How many times do we have to see Daredevil and Batman have hissy fits over whether or not to kill an unrepentant mass murderer when they have the opportunity. At this point it does make the characters look, quite frankly, impotent because they aren’t saving people they’re just delaying the death. Writers need to stop putting the heroes in that position. The best change to the X-books over the last decade is Cyclops finally outgrowing the very naive silver age idea that every life is precious. Some dogs need to be put down. By not putting down a rabid dog when given the chance makes you responsible for the next time a person gets bit. @ Robert, I follow your logic and I’m not advocating a softer, silver age style world, but there are so many Wolverine, Punisher, Deadpool, ‘bathed in blood’ style characters that Daredevil’s tradition of not killing, in spit of his violent world, was much more intriguing and came off noble. I’m not sure why it should be DD’s responsibility to kill Bulleye. It’s a lot to ask of someone to bear the emotional scars of taking someone else’s life, even Bullseyes’. I hate to ask the obvious question but if Bullseye needed to be put down because be was an irredeemable mad dog, what about Owl, Kingpin, Typhoid Mary … so on. I think down that road we have a very different character. What if he had taken that approach with Gladiator? He was a monster too. We’d have missed out his redemption and reform. Did Bullseye deserve to die? Sure, by why track DD in the process. I think there is a middle ground between the Wolverines, Punishers and Deadpools and the Supermans, Spidermans and Batmans. I know I used Batman in my argument for killing Bullseye, but I’m okay most of the time with Bats not killing. I think of him as some others do as being just as crazy as the Joker. His psychosis won’t let him kill whereas Jokers makes him kill constantly without care. Back to DD. I’m not saying he should kill every bad guy he comes across like Punisher, but the big dog killers, if given the opportunity in a fight? Yes. Typhoid M is a tricky case cause she has shown to respond to treatment. Kingpin and Owl aren’t crazy. They are evil as is Bullseye. I’m not saying I want these characters to all die, but I think the writers should come up with better stories that don’t always dwell on this issue and have the characters look incompetent. My earlier example from Born Again. Matt could have scaled a building, jumped or swung into the helicopter, disabled the pilot, and crashed the chopper and got the pilot out alive. But how many more people would have died in the time it would have taken him to do that? Miller even spelled that out. Every second he delayed lives were being lost, so he did the absolutely right thing and shot the pilot down with Nuke’s gun. How many fights have Murdock and Bullseye had where Bullseye was killing randomly? How many lives has Matt not saved by not putting him down when he had the chance? I’m enjoying the debate here. A lot of ground has been covered but I’d would like to point out that it’s a rather big assumption to take Matt’s word here. He didn’t know he was under Hand control even when he was taking demonic form, the degree to which Bullseye’s murder was his uninfluenced decision could be called into question. The desire to kill Bullseye was there, but the usual restraint was lacking. Why? I think a more interesting way to have Matt kill Bullseye would be on trial where Matt would plead for death penalty. I agree with people saying the lawyer side of Matt believes in the system. It’s just that DD lives in the USA and there, death penalty is part of the system. Why not using it ? That could at least make a cool What If story. Robert, you and I are normally on the same sheet of music and I agree creativity is key. The genre is such that Bullseye will be back, and no one is ever truly dead. I’m a killing is just wrong kind of guy, and I’m taking this hard. Born Again is a great example of killing someone because you absolutely must to save lives; it’s the cold-blooded killing of someone helpless I have a problem with. I hope Ian is right, I hope it wasn’t Matt in his right mind (though I think the writer are trying to force down our throats that he was) and JP is right as well. It’s one thing for society to say you need to die for your crimes, and another for someone to decide it on their own. I truly hope that DD: Reborn addresses several issues squarely: (1) Matt coping with permitting himself to kill Bullseye with no mitigating factors such as saving lives in imminent danger (ninjas don’t count; we all know this); (2) the NYC attorney general actively pursuing Matt Murdock for crimes committed as Daredevil within Shadowland, especially the taped slaying of Bullseye; (3) Matt trying to explain why the hell he completely cut off contact with his friends (both super and otherwise) and acted like a jerk; (4) Foggy, Dakota, and Becky trying to construct a Matt-free life. DAREDEVIL #512 hinted at (1), (2), and maybe (4). DD permitting himself to kill Bullseye with no mitigating factors is an interesting story, but it doesn’t appear to be the story that was told. I’m not claiming that ‘magical influence’ makes for a better story, just that it could be a factor in the context of the rest of Shadowland. Hank McCoy did WHAT now?!? Based on the circumstances, I think it’s acceptable for DD to have killed Bullseye. Given their history, not to mention the recent murder of an entire tenement building just to get at DD, it seems almost inevitable. By assuming control of the Hand, by forsaking his previous life and friends, I think Matt set himself up as his own kind of law and thus why he committed this act. Is Matt a killer? No. The surrounding circumstances led to that act. Had that been the beginning of a moral slide that would have lead to the confrontation between heroes & friends instead of a lame possession deal, Shadowland would’ve been a more personal, better dramatic story. I agree with Robert though. Killing Bullseye seems to be the most coherent characterization of Matt in this event. yes, this one is a mind bender. I really like the rail switcher dilemma presented. I would like, as I believe we all would, to see Matt be able to always be able to abide to his no kill code. I think it was a bit hasty to state that the unpossessed killing would have a more compelling effect from a storytelling point. I am referring to the many, many and ever so increasingly many accounts of “I don’t know, I just heard the voices telling me to do it” cases that we are constantly hearing. This specific case mirrors one of the few points that I was trying to relay as being cause for confusion and schism that create the need for a cleansing within Marvel. I would advise fellow fans to take things like this and other examples with a grain of salt. Just because a writer comes along and creates a change, even a large change, it need not mean “Final And Written In Stone”. They may have good intentions, but if it does not pan out, then it can and should be rectified. That’s a five star example if having the ability, I too would travel back in time and eliminate Hitler before the chaos he caused. I have had one of my own hit out in broad daylight and on large but densely populated boulevard.. it was one of those stetson and tinted eyeglass wearing, well past middle age, fat cheeked, cigar chompers behind the wheel.. and the SOB started accelerating when I first became aware of what was about to happen. I have posted feelings on this topic elsewhere before reading this one. The code is correct and from all angles. But what someone may be capable of doing in cases like this, involving the loss of innocents and loved ones at the hands of violence, well I must admit that I cannot say for sure, never having had to experience pain on that level. And I hope no one I know will ever have to either for we are only human.